Pop 'n' Fresh: Would you believe "Get Smart" is a fun spy comedy? Would you believe "Get Smart" is a fun spy comedy? Spy comedies were never really a wildly popular type of flick until a certain 'shagadelic' agent came along and turned the genre around. Since then we've had agents like Codi Banks, the Spy Kids and even a film based on the TV series I Spy. But long before any of these characters came along, a sophistcated, debonair super spy was keeping the world safe. No, not that Bond guy. I'm talking about Maxwell Smart, the gadget saavy, snappy dialogue-spewing agent who reappears in one of this summer's most hyped films Get Smart. 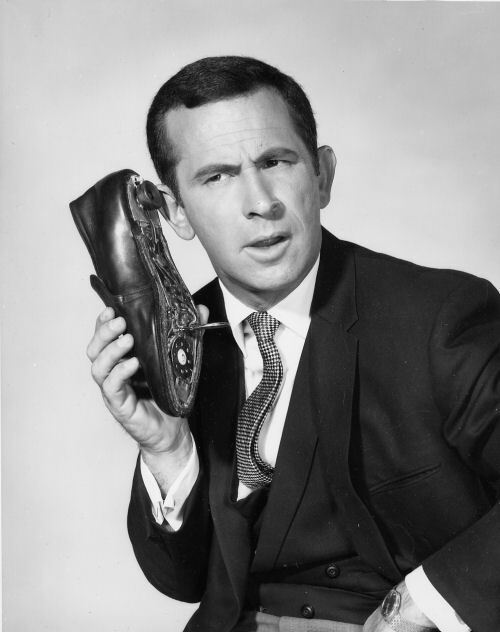 But since Don Adams has since passed, this time around Max's shoes (or shoe phones) are filled by Steve Carrell. And would you believe the results aren't bad? Our story opens in Washington, where a museum exhibit assures the public that CONTROL, the former super spy organiztion that kept the nation safe for years, was disbanded after the Cold War. But little do they know that CONTROL is alive and...well, so-so, since the organization seems to be made up of two cliques: the agents who go on secret missions and live an exciting lifestyle and the analysts who build the spy toys and pour over hours of information. Analyst Maxwell Smart (Carrell) has just taken his spy competency test, hoping to step out from behind his desk and into the field. He gets his chance when CONTROL headquarters, along with the identities of all their agents, are compromised by the terrorist organization KAOS. The only other agent still undercover is Agent 99 (Anne Hathaway), a skillful and deadly femme fatale who ends up being paired with the newly-promoted Smart. They're sent to Russia to try to stop KAOS from using atomic weapons to ransom the globe. Hilarity ensues. While the movie relies more on slapstick-style laughs and less on witty dialogue (unlike the TV show), it's easy to see that the actors are really getting into their roles and having fun with them. Carrell and Hathaway have a nice chemistry behind them, while Dwayne Johnson (The Rock, for you wrestling fans) plays a fun/confident dashing super spy and friend to Max. Terrence Stamp is cold and ruthless as the villain Siegfried, but constantly surrounded by his less-than-bloodthirsty henchmen Shtarker (Ken Davitian) and Dalip (Dalip Singh). Even the bit parts of analysts Bruce and Lloyd (Masi Oka and Nate Torrence) lend themselves to a few laughs. But to me, the biggest surprise came in the form of Alan Arkin as The Chief. A fiery old timer, Arkin breathes life into what could have been a bland role, flying an airplane with obvious skill and even fist-fighting the Vice President. Plus, with cameos by James Caan, Bill Murray and Patrick Wharburton, it's easy to see that this movie has talent. Be forewarned, though: if you're looking for a remake of the TV show, keep walkin'. While the characters are fairly similar, the script has been updated and the jokes can be hit or miss. Carrell's Smart is bumbling but far from dumb - most of his antics are simply counterintuitive to the situation but somehow (almost) always work. While his use of gadgets is here, he only uses the trademark shoe phone once. And when Carrell gives voice to Maxwell Smart's famous catchphrases, they sound a bit forced. But even with its flaws, the film is a fun one and worth the price of a movie ticket. While the script is simply okay, the talented stars end up carrying the film the rest of the way and, let's face it, in the case of Get Smart, you can't exactly expect Shakespeare. A perfect summer film? Missed it by that much!! !